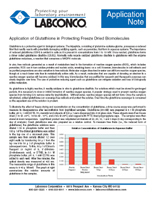 Glutathione is a protective agent in biological systems. The tripeptide, consisting of glutamine-cysteine-glycine, possesses a reduced thiol that readily reacts with potentially damaging oxidizing agents, such as peroxides, that form in aqueous systems. The importance of reduced glutathione (GSH) is evident in cells as it is present in concentrations from 1 to 10 mM. Once reacted, glutathione forms a dimer called glutathione disulfide (GSSG). Normally cells recycle oxidized glutathione disulfide to glutathione with the enzyme glutathione reductase, a reaction that consumes a NADPH molecule.